1: Inconel Wire includes Inconel 600, 601, 625, 718, X750, etc. 2: It is made for applications in high temperatures up to 2000oF. 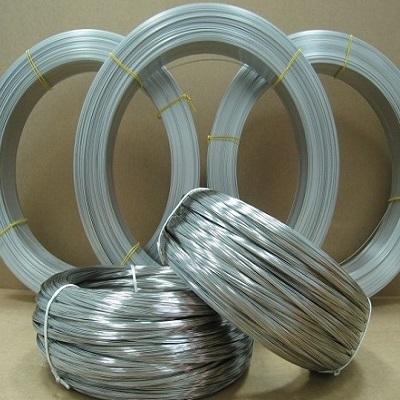 3: Inconel wire is oxidation and corrosion resistant. Inconel wire is made for applications in high temperatures up to 2000oF. Inconel wires are oxidation and corrosion resistant materials with strength to perform at a wide range of temperatures. Due to these properties, Inconel wires are preferably used over steel. They have main applications in energy, heat treating plants, chemical industry, pharmaceutical, aerospace and nuclear engineering. Inconel alloys are resistant to organic and inorganic compounds, chloride ion stress-corrosion cracking and alkaline solutions. We produce Inconel wire in grades- Inconel 600, Inconel 601, Inconel 625, Inconel 718 and Inconel X-750. Inconel 600 Wire: Inconel 600 is a non-magnetic alloy that is used in the diverse corrosion resistant applications for offering exceptional resistance to chloride based stress corrosion cracking. It is fit for use in high temperature media up to 2150oF. It is usually specified for applications in nuclear steam generator, heat processing baskets, fixtures, trays and furnace muffles, chemical and food processing units. Inconel 601 Wire: Inconel 601 is used in applications that demand heat resistance, corrosion resistance and oxidation resistance. It has high mechanical strength and prevents attack in aqueous media. Alloy 601 is resistant to carburization and can serve adequately in sulfur based environments at high temperatures. 601 alloy forms a firmly adherent oxide layer that prevents spalling even during vigorous thermal cycling. Inconel 625 Wire: Inconel 625 is corrosion and oxidation resistant nickel based super alloy. It has good strength and hardness at wide level of temperatures from cryogenic to 2000oF. It has supreme fatigue strength and resistance to chloride based stress corrosion cracking. Alloy 625 is typically used in heat shields, furnace hardware, gas turbine engine ducts, chemical plant components and marine applications. Inconel 718 Wire: A hardenable nickel based super alloy that offers supreme high yield, tensile and creep rupture characteristics up to 1300oF. The alloy retains oxidation resistance property throughout its service temperature limit. Alloy 718 is typically used in gas turbine engine components, jet engines, high speed airplane components including spacers, buckets, wheels, liquid fuel rocket motor, spring and cryogenic tanks. Inconel X-750 Wire: It is a hardenable alloy with high service temperature. This makes it suitable for use in jet engine components, nuclear plant units, heat treating fixtures, forming tools and extrusion dies and gas turbines. Alloy X-750 prevents chemical corrosion and oxidation and has great stress-rupture strength with nominal creep rates at temperatures up to 1500oF. It also resists chloride based stress corrosion cracking like above grades and offers good service in various oxidizing media. Inconel alloy wires made from above grades are specified for applications that involve caustic and general corrosion in high purity water and other media. Each grade of Inconel has special properties that make it suitable in diverse environments. Most of these grades are commonly used in the chemical industry. If you have questions about these alloy types and their applications, you can contact us at sales1@super-metals.com . We can provide you comprehensive information on different Inconel alloy wire types and their resistance to different forms of corrosion.